Sublime pops of marigold and charcoal create striking intrigue in this transitional style. Stain-resistant fade-resistant and pet-friendly this premium polyester power-loomed design renews traditional motifs in earthy tones like inviting ivory warm gray and sophisticated blue while still offering much needed durability for high traffic spaces in eclectic bohemian traditional and transitional homes. Dimensions 93.0 In. X 27.0 In. X 0.59 In. "are the blues and yellow subtle or bright? And main background color is the gray or beige?" 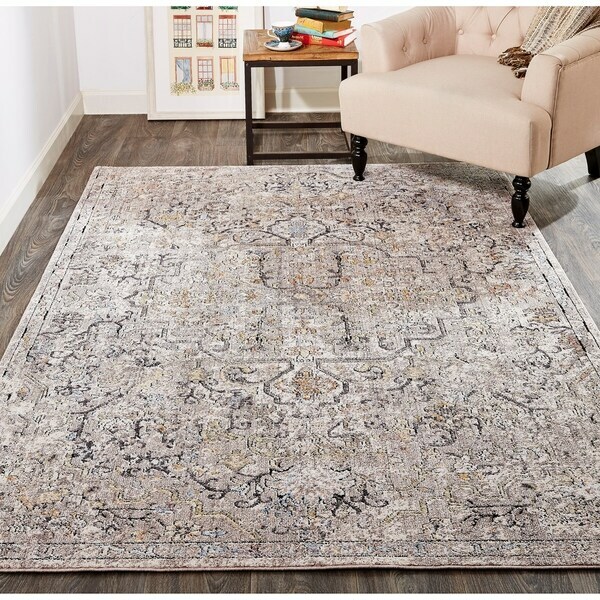 The colors within the rug are subtle and the background color is grey.